Every two months the column TUX&GNU@school  reports about free software, a homepage on topic and an easy to implement idea. This month I talk about GAMGI , a free material education program, about the projects Skolelinux  and KDE Edutainment  and about the idea "Something neat for KDE-Edu" ;-). Welcome to the 8th edition of TUX&GNU@school. In the meantime I looked after the longstanding newsletter as I promised in the last edition. There you can subscribe and you receive the recent version of the column every two months. At the moment the newsletter  exists for five languages. Yes, you heard correctly, there is another language (Spanish ) beneath the existing ones (German , English , French  and Swedish ). Thanks to Samuel Gimeno. Some days ago Carlos Pereira sent me an Email in which he asked me if I couldn't present his program here. Of course I like to do things like that and would like to do it right now. The following description originates almost completely from Carlos himself who is also the lead author of GAMGI  at. GAMGI stands for General Atomistic Modelling Graphic Interface. The program is licensed under the GNU GPL  and you can build, view and analyse atomic structures, such as molecules, crystals, glasses, liquids, etc. with it. 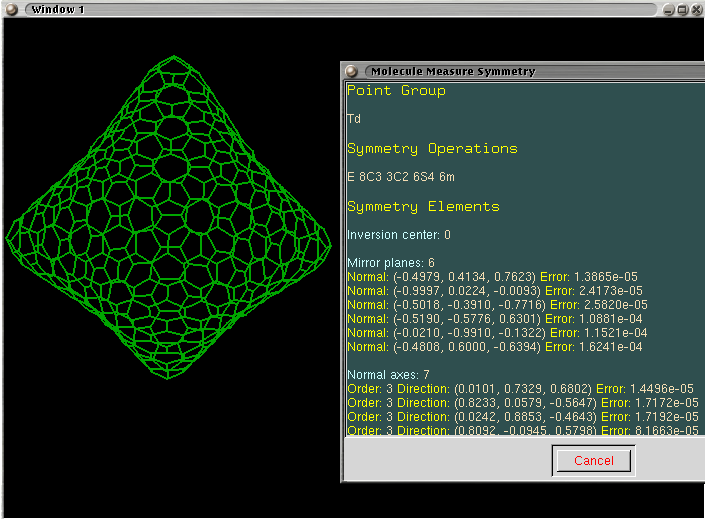 GAMGI supports the 230 crystallographic space groups, and can be used for example to perform point symmetry and 3D Voronoi analysis. Furthermore GAMGI supports multiple windows, layers and lights and offers maximum control over even low-level objects as atoms, bonds and text objects. GAMGI comes with XHTML documentation that can be seen with a browser or the program itself. The program also comes with hundreds of files describing relevant molecules, clusters and cells. These are provided in GAMGI XML native format and be loaded out-of-the-box. GAMGI is written in ANSI C and requires glib 1.2/gtk 1.2, gtkglarea 1.2, mesa and expat libraries, easily available in all Linux distributions. Meanwhile the program consists of the considerable amount of 150,000 lines of code. There are two mailing lists , one for helping users and the other one to discuss the development itself. Andre Truter, a Software Engineer, is building packages for GAMGI. Currently there are packages for SuSE and Debian . Packages for other systems will be available on request. Further on Carlos writes in his mail that, although he has written GAMGI from zero and it is not a copy of any other program, he was certainly inspired by other programs as InsightII and Cerius2 during his PhD thesis. Sure he speaks about the many things still missing but the program is already quite useful and especially in the teaching area. When you have some questions or suggestions Carlos  would surely be interested. But now to the first project of this edition that is to say to Skolelinux. Skolelinux  involves a Debian  based distribution which is targeted at the use in schools. It was and is the goal of the distribution to offer everything configured with an easy and simple base installation. This because today a lot of teachers have to administrate the computer pool in their school. Many thanks go to Knut Yrvin, the Norwegian project leader, and Kurt Gramlich, the leader of the German Skolelinux project, for the replies to my questions. Perhaps some of you have already noticed that Skolelinux is a project from the North of Europe , from Norway to be precise. "Skole" means "school" and what "Linux" means should be clear, isn't it ;-). The project came into being in June 2001 when Petter Reinholdtsen and Knut Yrvin talked at a summer party about the misery in school. Almost exclusively there was deployed proprietary software with user-unfriendly licences. This should be changed and today there are surely more than 200 schools  in Norway alone which work with Skolelinux. Furthermore the project is capable of paying three people full time and in addition to this there are a number of volunteers doing short stints. Arisen as a Debian derivative in Norway last year Skolelinux merged more or less with the Debian subproject DebianEDU . Surely this was quite important for the circumstance that people from different countries were now interested in Skolelinux. And so we arrive at Kurt Gramlich and Skolelinux Germany, who adapted the school distribution to country specific situations. By the way this means not only translating it into the own language but also things as screen locking at school which is not necessary in every country. In Norway the project can count on the support of the state and some firms. Additionally they are making a feasibility study about Skolelinux in schools of Oslo. Before I forget it, Skolelinux has now arrived at its frist stable version: Skolelinux Venus 1.0 . And we are getting thrilled about the coming version which will be based on Debian Sarge which includes more recent software. Further countries with Skolelinux offshoots are e.g. France, Greece and Uganda. Admittedly the German Skolelinux project seems to be the most active one beneath the original one in Skandinavia. These people, who are all volunteers, are working extremely fast and are represented with a booth at almost every Free Software event in the country. They are also very strong in documentation  and they have with Skolelinux.de  their own homepage. In Gütersloh (Germany) they even run a small test centre where they develop and teach on a regular base. A few exemplary works of Skolelinux Germany are e.g. a possible integration of the learning management system ILIAS  or moodle , a Windows binding or the product concept catalogue for quality management . For the future there is enough to do not only in Germany what means that some of you can contribute confidently. Possible starting points are an even better documentation, the translation into your own national language or programming of simple education software. It would be especially interesting if you had some pedagogical knowledge. Addendum: At the this year's Systems in Munich (Germany)  they received the Linux New Media Award  in the category Best Newcomer Distribution. We are thrilled about what is happening in and with Skolelinux in the future and I will keep you informed. But now to the second project of this edition where Anne-Marie presents recent news about the KDE Edutainment project. As you know, KDE 3.3 has been released by the end of August and the bug fix version 3.3.1 was released just a few days ago. There have been some changes in the KDE-Edu  applications. KWordQuiz  is a replacement for FlashKard with a few more functionalities. It's a vocabulary learning program with flash card mode or multiple choice mode. Some nice feedback informs you about your score. KTurtle  is a new Logo interpreter. It features an integrated Logo interpreter, full screen mode, a powerful editor to type your code and more. The Logo programming language is very easy and thus it can be used by young children. A unique quality of Logo is that the commands or instructions can be translated and KTurtle already has translations for ten languages. KTurtle won the third prize  in an educational programming contest by the Dutch Linux Programming magazine  (only in Dutch). KHangman  has been improved following a nice usability study . KTouch  (touch typing) and KEduca  (a test maker) have new maintainers. KStars  is becoming one of the best astronomy program in GNU/Linux. For the future, we would like to build a mathematical program aimed to students aged 8 to 15 about areas, perimeters, numbers and such. A program about geography  is also being developed, the main difficulty here is to make the maps (use free maps and adapt them). In all educational programs, the data is the most difficult part as it needs to be translated in the maximum of languages possible. Instead of the presentation of a special idea I want to refer to Anne-Marie's calling: create data for free education programs and send it to the KDE-Edu project. And at the end follows the news. KEduca  has found a new maintainer, Henrique Pinto. Henrique started to work quickly on KEduca and made it a KPart (that means you can open keduca files embedded in Konqueror for example). He also coded compression of the test file so the pupils cannot read it. Now KEduca needs new icons, you can find all the details on the KEduca-icons  page or on the KDE-Look website . So if you are an artist, this is a great way to contribute! KEduca , KMessedWords  and KVocTrain  are looking for new maintainers. What does that mean? KMessedWords GUI should be re-arranged and the main thing to do is to i18n the dictionary so that all KDE languages can be used. A possible feature is also to cut the words in syllables. Using KHangMan data files (with hints when available) could also be done. This is not too demanding and could be possible for a beginner. For KEduca, the main feature would be to encrypt the xml file so that pupils cannot read the answers. Porting to current kdelibs would also be required. KVocTrain requires more work and a complete rewrite should be done as the code is really very old. Anyone interested should come forward on the kde-edu mailinglist . Be assured you'll get plenty of help and you'll share great fun with the KDE community! The aKademy KDE World Summit  has started and, while no KDE-Edu people are present, Anne-Marie is working with some people there. An IRC meeting has been done today with Phil and Lauri from the KDE documentation team. Several ideas has been discussed: having a kid-oriented doc, having Quick Start pages for each program, writing a new template for edu docs... We also try to go through each Handbook and see what could be improved. Thanks a lot to the Documentation team people who demonstrate how team work makes KDE better! See this page  to know how to better write your documentation. Celeste Paul wrote a very complete usability study  for KHangMan . Her suggestions will be applied and you can follow progress on that on the KHangMan usability page . Thanks to Celeste for this amazing work! KWordQuiz  joined the kdeedu module and replaced FlashKard . KWordQuiz will allow you to study your vocabulary words (WordQuiz and kvtml formats supported) and keep all FlashKard functionalities. In addition, the Quiz mode is great and the Editing mode very powerful. LinuxMagazine  wrote two pages about KWordQuiz in Issue 41 and kindly put the article online , thanks a lot!. The KNewStuff library is now in kdelibs therefore available for applications that need it. KLettres in cvs HEAD and KHangMan (make_it_cool branch) are successfully using it. This library allows the program to get and install in a few mouse clicks new data from a website. A HowTo is available in the developer section of this website  to help you with using this new library. Andreas, the current KTouch  co-maintainer, will start a new version of KTouch. He has designed a new concept  and would like feedback on it. Please stay in touch with him and send him  all your requests and features wishes. Ok, that's it once more. We'll see next year. Mario Fux finished 1999 the PrimarlehrerInnenseminar in Brig, after which he then caught up on the mathematical and natural scientifical matura. Currently he studies at the university of Zurich in the main subject education (pedagogy) and computer sciences as the subsidiary subject. Together with two colleagues he founded the "ALIS - Arbeitsgruppe Linux an Schulen" (Swiss work group for linux at school). And if he is not spending his time in front of the PC, he sits at his nature pond in the mountains.